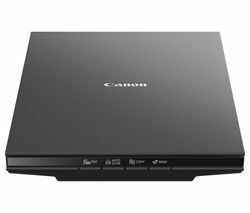 Canon scanners offer high-quality scanning encased in a sleek design, for all your scanning needs. The conveniently compact size and flatbed design means they are perfect for both home and office use as they won't take up too much desk space. They’re also lightweight, so easy to move to wherever you may need them, and the subtle design allows these scanners to fit into your workspace aesthetic with ease. With a colour contact image scanner, your Canon scanner doesn't compromise quality for convenience, reproducing brilliant bright colour and immaculate image quality on your screen. Fast scanning speeds mean you'll never have to wait long for your documents or photos to be ready to use. What's more, a Canon scanner won't disturb you as you work because they run quietly, producing remarkably little noise disturbance. Canon scanners will cover all your scanning requirements. Despite their compact size, models like the Canon Lide 220 are well suited to high volume scanning. Effortless installation and ease of use mean you'll be up and running in no time. If you're looking for a scanner that's suited to more delicate prints, view our Epson scanners which offer the ability to scan slides, film, and negatives. The Epson V600 features Digital Ice technologies, which enable the restoration of film slides and photos, removing imperfections for clear, grain-free scans. It also features a resizable preview window so you can check the detail of your images. Epson Easy Photo Fix on the Epson Perfection V550 also helps to restore faded colour and removes the appearance of dust as well as adjusting backlighting. Epson ReadyScan LED technology ensures that there is no warm-up time, so you can start scanning immediately and also uses less energy, making it a real money saver. To see our complete collection be sure to view all photo scanners.